Huma Abedin on August 29 announced that she has decided to separate from her husband, Anthony Weiner, after the New York Post reported on August 28 about Weiner’s latest sexually explicit messages with another woman, including an image of him half-dressed in bed next to his young son. Huma Abedin was among 10 current or former State Department officials asked by their former agency to provide any similar messages on their private accounts. But Abedin’s lawyers said she didn’t receive that request for more than two months after it was sent on March 11. Abedin is currently vice chair of Clinton’s presidential campaign. As he weighs whether to leap into the race for mayor this year, Mr. Weiner’s lucrative stint in business could serve as a compelling campaign credential, blunting efforts to portray him as a career politician, even as it raises uncomfortable questions about the speed with which he cashed in on his government connections. He and his wife, Huma Abedin, a longtime aide to Hillary Rodham Clinton, disclosed last week that they had a combined income of $496,000 in 2012, most of it from Mr. Weiner’s work. The money provided a lifestyle-changing infusion for the couple, who moved from a modest home in Forest Hills, Queens, to a large apartment on Park Avenue South in Manhattan. it is not the office of mayor that gives the man stature, WAPO says, but the man who gives this fairly rotten job of holding back squabbling thugs and bagmen some lift and flight. The mayor of New York is our actor and salesman. He or she has to fill the stage and make the sale. Hence, against all likelihood, Weiner’s inevitability. But his reappearance this week on Twitter – the instrument of his original downfall, where he was last seen in a state of undress and disgrace – must surely presage the announcement of his candidacy. But first a recap of the terrible existential plight of the current field of candidates. There’s William C Thompson Jr, who, like Abe Beame before him, was once the city comptroller; there is Christine Quinn now the city council speaker; there is John C Liu, the current comptroller; there is Bill de Blasio, the city’s public advocate; and there is Sal Albanese, a former councilman from Brooklyn. Among the most soul-killing words that can be uttered about a public offficial are “He [or she] rose through the Democratic party organization in … [name any of the key precincts of the city]”. It is not that you would have necessarily become corrupt (although it is not clear how that could actually be avoided, and various issues attach to each candidate). Political insiders were abuzz at news that Weiner and his wife, Huma Abedin, had granted a lengthy magazine interview for the first time since his resignation in an embarrassing sexting scandal in 2011. “The magazine piece is step one of a two-step process for him to run citywide this year,” said one Democratic Party source. Weiner issued a terse “no comment” when asked about his plans. Weiner has $4.3 million left in his campaign account, including $248,710 that would be matched 6-to-1 under the public-financing system. Anthony Weiner’s wife is taking time off from her senior job with the State Department, Huma Abedin, will be relaxing at an undisclosed location. Representative Anthony D. Weiner and Huma Abedin are about to make news of a different kind: they are expecting their first child. His district, like almost all districts encompassing New York City, is Democratic, although significantly less so than the districts surrounding it. In order to accommodate surrounding districts with majority black or Hispanic populations (the 6th, 10th, 11th and 12th), it has been drawn to consist primarily of middle-class white neighborhoods (the district as a whole is 71% Caucasian, 14.5% Asian, 13.6% Hispanic and 4% African-American). The district includes large Jewish, Italian, and Irish populations. Weiner took the Specialized High Schools Admissions Test (SHSAT), and entered Brooklyn Technical High School. He had failed the admission test for Stuyvesant High School by one point. After graduating (1981), he attended the State University of New York at Plattsburgh. While Huma Abedin traipsed around the country as Clinton’s traveling chief of staff, Weiner, 46, became a fixture on those campaign trips, courting the George Washington University graduate who was Clinton’s right hand. 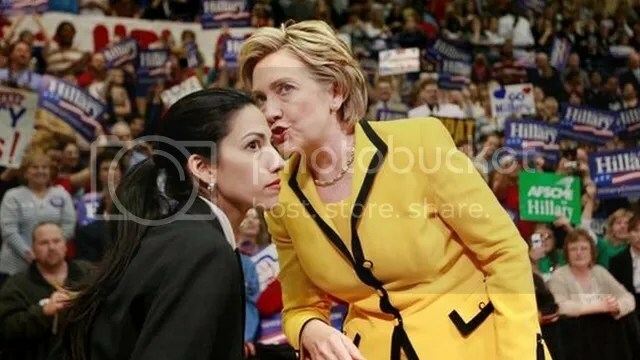 Born in Kalamazo, Mich. but raised in Riyadh, Saudi Arabia, by an Indian father and a Pakistani mother, Abedin, 35, is one of the few Clintonites to have been an insider from Clinton’s White House days to her stint at the State Department.